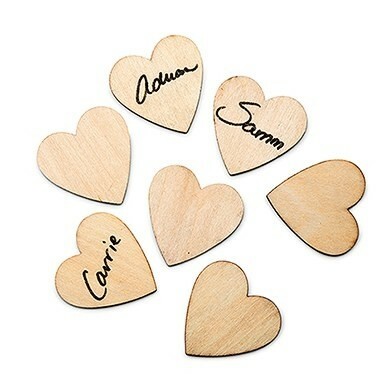 Dimensions: 1 1/8" x 1 1/2"
This package of 50 wooden craft hearts provide a unique way for guests to leave best wishes and other messages to you at your reception. Guests may write on the hearts with a felt tip pen (not included) then drop into them a drop box guest book frame or collected in any other decorative container to create a lasting keepsake that can be enjoyed for years to come. The wooden hearts are non-personalized. A selection of personalized drop boxes is available separately as Product Codes beginning with ER-4603.